Name of ethnic group: Ha Nhi (U Ni and Xa U Ni). Population: 17,535 people (Year 1999). Locality: Lai Chau and Lao Cai provinces. The Ha Nhi have adopted a sedentary lifestyle. Every year during Tet (New Year’s Day), the people of the same lineage get together to listen to an elderly man speak about their ancestors. Young men and women are free to choose their partners. Each marriage goes through two stages. In the first stage, young men and women become husband and wife and take the family name of the husband. The second stage is organized when the couple becomes established and has a child. When a person dies, the bedroom partition of the deceased is dismantled, as well as the altar for their ancestors. The dead body is placed on a bed in the kitchen and a good hour and day must be chosen for the burial ceremony. The Ha Nhi language belongs to the Tibet-Burman Group. The Ha Nhi possess many ancient tales and long versed stories. Young men and women enjoy dancing. Young couples express their love by playing leaf panpipes, lip organs and a vertical flute. Young girls like to play “am ba” and “met du” and young boys like to play “la khu”. There are many types of songs in Ha Nhi society such as lullabies, duet songs, wedding songs, mourning songs, songs reserved for new houses, receiving guests, and welcoming Tet holidays. 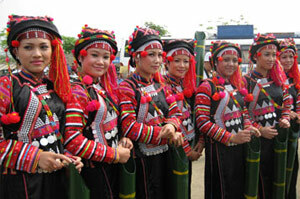 The women of Lai Chau wear a decorated dress in various raw colours. This is different from the dress of the Lao Cai women which is only indigo in colour. The Ha Nhi use a slash-and-burn method of cultivation and plant on terraced fields. Animal husbandry is well developed as well as weaving cloth and basketry articles.